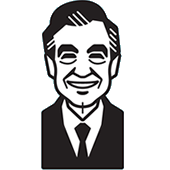 Mister Rogers arrives with an alarm clock that has a clear face and shows the gears turning inside. Looking at each of the clock's outside parts, he demonstrates how the alarm works. Mister Rogers goes on to explain that a long time ago, clocks were made using sand. With two paper cups -- one with a hole in the bottom -- and some sand, he creates a makeshift hourglass. Sprinkling some of the sand on the kitchen table, Mister Rogers makes a simple design before introducing an animated film of sand designs. In the Neighborhood of Make-Believe, King Friday asks Handyman Negri to find a loud alarm clock to be set for "thirteen and one half" so everyone knows when it is time to come to the castle and watch the television program he wants them to see. Lady Elaine Fairchilde has "a zillion" clocks but hesitates to lend one out as she knows it will be used to call everyone to the castle for the television show that no one is interested in except King Friday. With the alarm clock set, Handyman Negri is instructed to make sure no one leaves during the television program as King Friday himself will be attending to "some royal affairs" and will not be present. The alarm clock sounds as everyone arrives at the castle. The audience quickly loses interest and is informed by Queen Sara that King Friday is inside the castle playing his bass violin. Deciding they should all be allowed to do what they want to do, the Neighbors disperse after King Friday insists that they come back tomorrow to watch the television show again. Lady Elaine has a plan and suggests they all gather at the Museum-Go-Round tomorrow instead. Back at the house, Mister Rogers goes to the back yard where Mr. and Mrs. McFeely stop by and help him convert his work bench into a sand table. The sand animation film is also seen in Episode 1224 and Episode 1647. An elephant is seen in the animated film about sand. During the few seconds it is on the screen, an instrumental of We Are Elephants is played. Handing the clock off to Handyman Negri, Lady Elaine accidentally drops it to the ground. 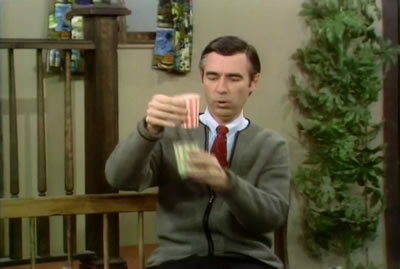 Singing Tomorrow, Mister Rogers separates the two cups holding sand as he sings "One, Two." Sand spills from the hole in the bottom of the top cup as he interjects a quick, "Uh, oh!"